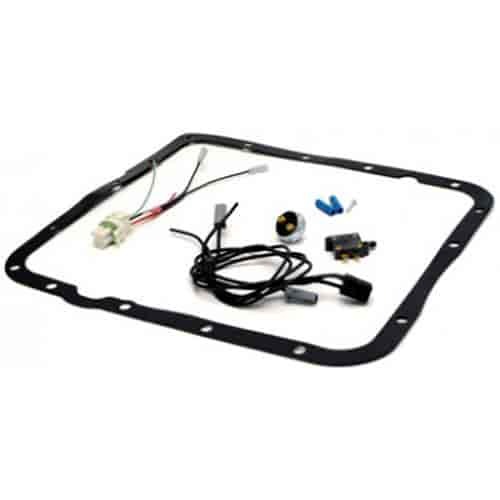 TCI's 2004R / 700R4 Universal Lockup Wiring Kit provides hands-free, automatic activation of the torque converter clutch in 4th gear and will disengage the clutch when you accelerate or down shift. This easy-to-install, universal lockup wiring kit makes it possible for you to install a GM 700R4 or 2004R transmission into a non-computer controlled street rod or muscle car. It is also beneficial when removing a factory computer in pre-1993 vehicles with a 700R4 or 2004R transmission. This kit contains quality OE connectors and oil-resistant wire. Kit comes complete with a gasket, wiring harness, vacuum switch, 4th gear pressure switch, splice connectors, mounting screw, and detailed instructions. Note: Supplied with 700R4 pan gasket only. Does TCI 376600 fit your vehicle? 376600 is rated 4.4 out of 5 by 8. Rated 5 out of 5 by Rpino from Fast delivery and easy to install, highly recommend. Rated 5 out of 5 by Very Satisfied from Nice kit Good deal for the price. Reasonably easy to install, works well. Rated 5 out of 5 by obek from it works!! this kit increased my gas mileage by lowering my engine rpm. Rated 5 out of 5 by 83 Elco from Lock up kit I bought this kit a couple months ago when I converted from a TH350 transmission to a 700R4 on my 83 El Camino. After researching and seeing the great reviews for the kit, the price and free shipping from Jegs couldn't be beat. So far, I haven't had any problems and it has been working great! Rated 1 out of 5 by torqued05 from never again I would never buy this again and I hope no one else does.